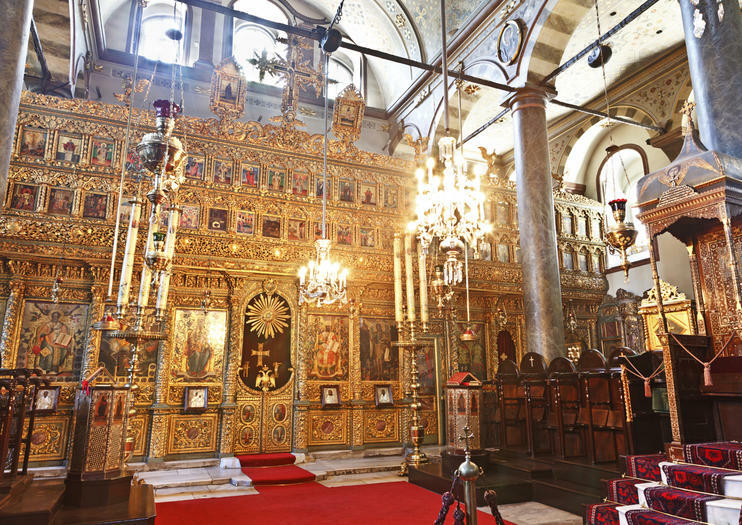 Istanbul’s Church of St George has been the seat of the Ecumenical Patriarchate of Constantinople since 1600. Since the fall of the Ottomans, the Greek population of Istanbul has largely emigrated, so today it’s more of a symbolic center of the Ecumenical Patriarchate than anything else, but the spiritual leader of the world’s 260 million Greek Orthodox, Bartholomew I, continues to hold services here, and Orthodox Christians from Greece and across Eastern Europe stream though the church as pilgrims. With its 19th-century neo-Classical facade which was constructed after severe fire damage, the church may look modest on the outside, but go inside and it’s a different story. Notice the Patriarch’s marble throne at the center of the altar, the huge chandeliers hanging from the ceiling, and gold everything. Inside you’ll also find beautiful mosaic icons, and over the altar look out for the two-headed Byzantine Eagle. Just behind the church you can see the offices of the Patriarchate as well as the Patriarchate Library. On Yavuz Sultan Selim Mh in the Fener district of Turkey, the Ecumencial Orthodox Patriarchate church is open to the public from 8:30am to 4pm, but strict security screening is in place. Donations are welcome. See Istanbul from three different vantage points on this 3.5-hour tour including a sightseeing cruise, panoramic tour and cable car ride. Take a scenic 1.5-hour cruise on the Bosphorus and admire top Istanbul attractions such as the Bosphorus Bridge and Rumeli Fortress from the water. Then, take a coach drive around the Golden Horn districts to see the former Jewish quarter, old city walls, iron-built St Stephens and other lesser-known treasures. Lastly, catch the cable car up Pierre Loti Hill to witness the stellar city views from its hilltop café. Gaze over land and sea on this 3-hour guided Istanbul city tour with a Bosphorus Strait sightseeing cruise. Aboard a comfy coach discover the lively neighborhoods of Fener and Balat and drive along the Golden Horn for spectacular views. With your expert guide experience the vibrant Spice Bazaar and then board a charming sightseeing cruise to traverse the Bosphorus viewing highlights like the Bosphorus Bridge and Rumeli Fortress. Explore the many renowned sites of Istanbul on this small-group, half-day tour of its historical landmarks. Enjoy comfortable transportation in a plush Mercedes minivan. Travel in style with you expert guide to the enchanting Dolmabahçe Palace, then venture to other city highlights, like the Istanbul Modern Art Museum, the Spice Bazaar, the Rüstem Pasha Mosque, and the Jewish quarter known as Balat. Throughout the day your guide will educate you on the rich history of this unforgettable city. To ensure a quality experience, this group is limited to 14 people. See a wide range of Istanbul’s cultural heritage and skip the long lines on this customizable driving tour. In the company of a guide, depart from your hotel in a private air-conditioned minivan and make your way into the city. Stop at the Chora Museum, Suleymaniye Mosque, the neighborhoods of Fener and Balat, Pierre Loti Hill, and more. See second part of Istanbul Top 10 List. Visit the Underground Cistern, walk along Divanyolu Street (the Imperial Road) until Suleymaniye Mosque, the most impressive work of architect Sinan. Wander down to Eminonu area, strolling through the bazaar quarters. Short visit to the Spice Market (the Egyptian Bazaar) and we then continue with the Chora (Kariye) Church Museum after lunch at a local restaurant. Next, you will discover Istanbul's two of the most photographed neighborhoods. This is a special tour including some of the most unique places in the city but also which are difficult to visit on your own. The tour will take you to the roots of historic Istanbul with visits to the Muslim, Jewish, and Christian monuments.